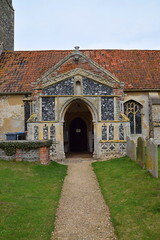 Like many medieval churches in Suffolk, St John the Baptist is remote from the village it serves. 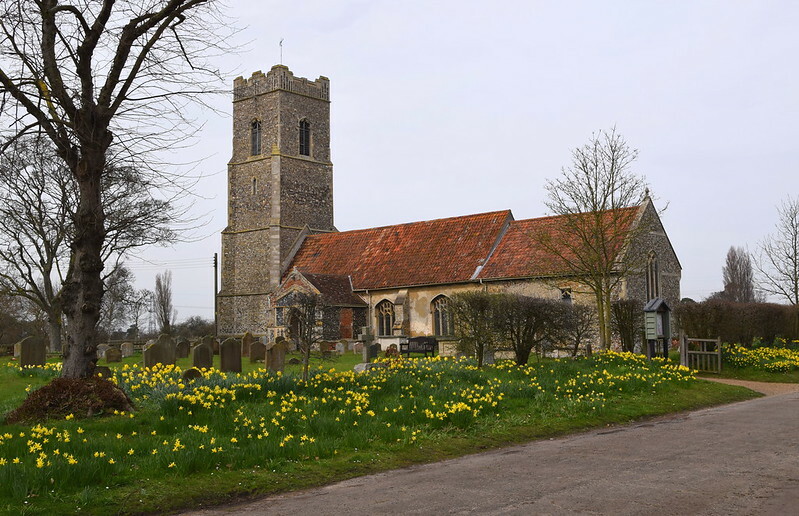 Or, it would be more accurate to say that the village is remote from the church, since the church stands on the main road from the A12 to Aldeburgh, and the village is off this road, a mile or so to the south. 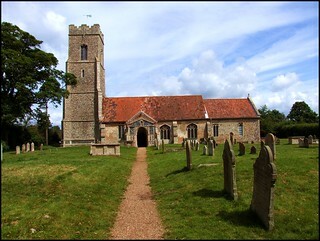 The position of the church probably reflects the fact that it is high, firm ground, while the village is in the marshes. This is not to say that the village is not a busy place too of course, for just across the River Alde, and actually in Tunstall parish, are the world famous Snape Maltings, once the dockside and railhead of the Garrett industrial empire, and now home to the Aldeburgh Festival. Ironically, the tourists that flock the craft shops, galleries and cafes of the Arts Centre, and go for walks along the reed-banked creeks and across the marshes, probably don't often make it up to the busy top road and the church. The building today looks pretty much like Ladbroke's 1820 drawing. The Victorians didn't do much here, there was no building of aisles, transepts or trimmings. The only real change is the eastern wall, rebuilt in 1920 to replace the heavily buttressed yet collapsing original. This is a simple, aisleless church, with no clerestory. The roofline on the tower shows that it was once thatched. 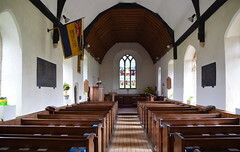 It is, let us say, a typical country church. The tower was built as the result of a bequest in the middle years of the 15th century, and the battlements added later, in the style of the 1520s. The porch is contemporary with the tower. 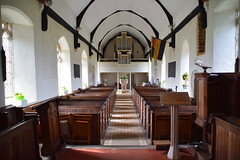 The nave and chancel are earlier, probably 13th century, and although they have been patched up over the years, there has been no wholesale rebuilding. 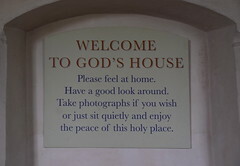 Inside, however, the modern age has been busy. You step into an utterly charming interior, full of light, with white walls and brick floors. 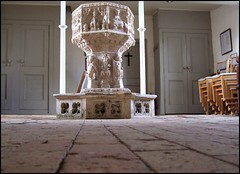 At the cleared west end is the church's great treasure, one of the most beautiful fonts in the county. 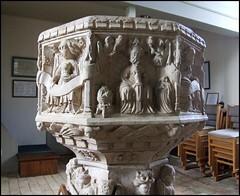 It bears a dedicatory inscription to the Mey family, and dates from the late 15th century. Strange animals lurk around the foot of it, and tthe stem bears the Evangelists with their symbols, interspersed with kings. But the most animated figures are those on the bowl. Seven of them hold a long scroll that goes right around the bowl. 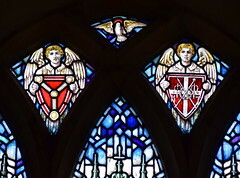 The eighth panel is a rare representation of the Holy Trinity, which was particularly circumscribed by iconoclasts in the 16th and 17th centuries. It shows God the Father seated on his throne, with the crucified Son held in front of him. The Spirit descends in the form of a dove. 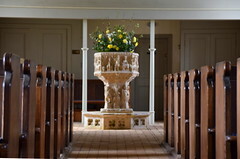 On either side kneel the donors of the font. 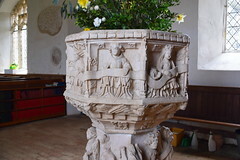 David Davy, visiting in the 1830s, said that the whitewash had been recently removed from the font. Perhaps what he meant was that the figures had been covered in plaster, which would explain their survival. Certainly, the puritan iconoclast William Dowsing saw nothing to incur his displeasure when he came here in 1644, and almost certainly the Anglican reformers had plastered it over a century earlier, the usual way of dealing with the problem of removing images while not actually destroying the font, which was still required by the new religion. 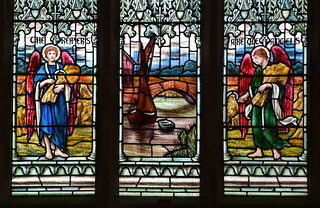 The views to east and west are beautiful, the colour of the Arts and Crafts east window perfectly poised and balanced. 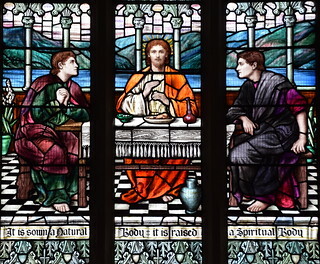 In the top half, Christ breaks bread at supper at Emmaus. Below, two angels flank the River Alde at Snape Bridge. 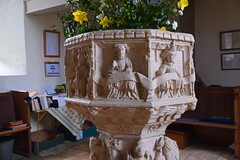 It dates from the 1920 restoration, and is by Mary Lowndes, perhaps the leading female artist in any medium of the last years of the 19th and first years of the 20th centuries. She is best known today for her work for the suffragette movement - she designed their posters. Through her work at the Glass House she was an influence on many younger artists, both male and female. Below it, there is often set a beautiful altar frontal, illustrating a line from Eliot's Four Quartets. The church used to have a 15th century brass of five little girls. 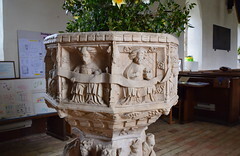 Davy made a rubbing of it, which is in the British Museum, but the brass has been stolen or mislaid since, probably in the 1920 wholesale refurbishment of the chancel. 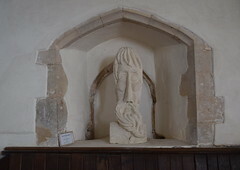 Outside in the graveyard, the war memorial is one of the most extraordinary in Suffolk, a broken-down classical feature looking down the road to the village. Unfortunately, it is not a pleasant walk because of the traffic, but there are a couple of good pubs, and the walks across the marshes beyond the Maltings are certainly worth the effort. Not far off is Snape Mill, bought by the young Lowestoft-born Benjamin Britten as a place to write, and to which he returned from America at the height of the War. He had read an article about George Crabbe's poem The Village with its account of the fisherman Peter Grimes, and knew that back home in Suffolk was where he had to be, and an opera based on the poem was what he had to write.